These training courses are typically short (1-day) courses at ‘Introductory’, ‘Intermediate’ and ‘Advanced’ levels. The courses can be combined into longer courses typically of 2 or 3-day duration. Our independently certified Open Awards qualification (see below) is believed to be the first laser safety qualification from a proper UK licensed awarding body. Our series of Laser Safety training courses cover the current BS EN 60825-1 and -14 and Laser Safety Standard. The LED and Lamp safety course covers the BS EN 62471:2008 standard and the Artificial Optical Radiation Directive. The courses are modular and can be run in sequence or as individual events. Public courses are not run on a regular basis but are arranged as and when the need arises. Any currently scheduled courses are listed on the right hand side of the page under ‘Public Courses & Events’. So as not to disadvantage trainees who do not have sufficient colleagues to justify a company ‘event’ type training course, we will schedule a public advanced laser safety course when we have just two confirmed trainees. Just contact us to discuss the options! Laser Safety – Open Awards certified award. This 2-day version of our laser safety introduction course is based on the 1-day course, but with a little more time to explain some of the concepts more fully, and with time for assessment so that trainees gain an award from the Open College Network (OCN), a UK licensed awarding body. This introductory course is a very good start for many staff involved with lasers, and the certification from an independent awarding body licensed by the UK’s Qualifications and Curriculum Authority (QCA) is valued by many laser safety officers and advisers. This is a course based heavily on our 1-day general training course in laser safety, but with additional concepts covering laser light in optical fibres and the BS EN 60825-2 standard covering laser safety in fibre optic communication systems. These concepts are covered by the 2-day Open Awards course above, but this course is an alternative to the 1-day general course above and is applicable to staff working with fibre optic equipment. This 1-day course is aimed at staff who use or come into contact with laser radiation. It is an introductory course aimed at trainees from a wide range of backgrounds and providing a basic understanding and appreciation of laser safety concepts, classifications, hazards and procedures. An aim of the course is to reassure trainees when lasers are relatively safe, and when the laser light is not the main hazard. This is important because an irrational fear of lasers can adversely affect both safety and productivity. LEDs are now becoming bright enough to pose a significant hazards for those who come into close, regular contact with them. They were removed from the BS EN 60825-1 safety standard at its last revision and now come under BS EN 62471:2008 ‘Photobiological safety of lamps and lamp systems’. This course explains this standard. The course is also useful for those who, after reading the guide to the Artificial Optical Radiation Directive (AORD), decide that they have non-trivial light sources in the workplace and need to understand what is involved in classifying such sources. A prerequisite for this intermediate course is that the trainee has attended an introductory course or already has a good appreciation of the basics of laser safety. The aim of this course is to explain how simple procedures and rules can help produce a very effective laser safety management system, and to explain how to go about implementing laser safety in the workplace. 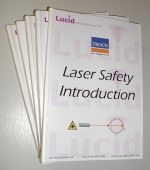 Trainees are shown where to start, and Lucid provide templates that can prove invaluable in quickly establishing a simple and easy yet very effective laser safety management process. This course is aimed at people responsible for implementing or managing laser safety in their organisations or in their workplaces. We have developed a range of more advanced laser safety courses that are a natural ‘bolt-on’ to our introductory courses. These courses are certainly not for all staff or laser users, but we are aware that many trainees have used little maths since school or college days, so concepts and terminology are introduced accordingly. This is a course that introduces the advanced concepts and then in a team workshop style appropriate calculations are done, often using our LaserBee laser safety software package. This course has proved very popular and useful to the trainees who have been on it, although we are aware that the ‘advanced’ tag and the thought of doing calculations is off-putting to some candidates. For the brave, they will be amazed at what they learn and proud of completing this advanced course. We are often asked if we can provide two hour or even 1-hour long laser safety sessions for staff within organisations. We know many organisations deliver such sessions themselves and refer to them as laser safety training, however we do not consider that they meet the requirements of EN 60825-1. Whilst they may have some merit, we know that there is a lot of information to squeeze into a 1-day laser safety course, and we can not condense this into just two hours. With laser safety training it is important that the training covers certain areas as described in EN 60825-1, and that the trainees are deemed competent to work with laser based products following such training. Whilst safety advisers may be happy to tick the box in a staff safety training matrix for some safety areas after a 2-hour training session, very few laser safety officers would be confident to do this. All of our laser safety training courses include a brief assessment to prove that the trainee has understood and learnt the basic concepts of laser safety. Trainees who successfully pass the assessment are awarded a certificate of competence or alternatively an independent Open Awards certificate, whilst trainees who do not achieve the required score gain a certificate of attendance and will be given the opportunity to resit the assessment at a later time. A series of introductory and advanced courses developed for laboratory based engineers and researchers in the photonics industry, but also suitable for managers and sales/marketing staff.